SEATTLE, WA. Seattle Symphony Orchestra Board of Directors Chair Leslie Jackson Chihuly and Interim Executive Director Mark McCampbell announced today that French conductor Ludovic Morlot has been named Music Director Designate, beginning in the 2010-2011 season. Maestro Morlot will assume the role of Music Director at the beginning of the 2011-2012 season with an initial six-year contract. Seattle Symphony's current Music Director, Gerard Schwarz, who has held that role since 1985, will assume the title of Conductor Laureate after his final season in 2010-2011. "I am thrilled and grateful to be given this wonderful opportunity to lead the Seattle Symphony into a new era," remarked Morlot. "I am eager to share many musical moments and emotions with the Orchestra and its faithful audience, and to meet new concertgoers in the beautiful Benaroya Hall. My family and I feel privileged that we will soon become part of the Seattle community." During Morlot's first season as Music Director in 2011-2012, he will conduct a minimum of eight weeks during the regular concert season. He will conduct a minimum of thirteen weeks each season through the end of his initial contract in 2017. When the then thirty-five-year-old Morlot made his debut with the Seattle Symphony in October 2009, the Seattle Times' Melinda Bargreen praised his "quick, snappy gestures and mercurial intensity [that] seemed to energize the orchestra." He was re-engaged later this season, when a schedule change prevented Roberto Abbado from appearing with the symphony. However, travel disruptions caused by the volcanic eruption in Iceland forced Morlot to miss two rehearsals and change the program on short notice. Under these challenging circumstances he delivered strong and exciting performances that underscored his remarkable poise, artistic presence and leadership qualities. The Music Director Search Committee then voted unanimously to recommend Mr. Morlot to the Board. Also, Symphony No. 32. Irena Grafenauer, flute; Francois Leleux, oboe; Gunter Wand; Sir Colin Davis, Bavarian Radio Symphony Orchestra. BR Klassik 900710. The BR Klassik label continues to provide good value with its Bavarian Radio Symphony Orchestra discs, this one a 2010 release of older recorded material. We get three different Mozart pieces, all written around the same time, 1777-79; two splendid soloists; two star conductors; and one outstanding orchestra. The program begins with Mozart's Flute Concerto No. 1 in G major, KV 313, written in 1778. The Concerto itself is the epitome of charm, grace, and delight, of course. The soloist, Irena Grafenauer, and conductor, Gunter Wand, are the epitomes of refinement and eloquence, so they work hand in hand with the music, producing a radiant performance. Over the years, a few critics have continued to believe that Mozart disliked the flute and resented having to compose music for it. If so, it certainly doesn't show in his one-and-only concerto for the instrument, especially as felicitously as Grafenauer and Wand play it, the flute lightly dancing throughout. This is old-school Mozart, to be sure, but gracious and engaging in the extreme. Mozart wrote his Oboe Concerto in C major, KV 314, in 1777, a transcription of which he tried to pass off a year later under the guise of a new flute concerto, and you will still find it sometimes listed as such. In any case, the Oboe and Flute Concertos share much in common with one another, both light and airy, with lovely, songlike, cantabile-based mid sections and spirited conclusions. Sir Colin Davis is a bit more lively in his direction than Gunter Wand, and the listener will find considerable bounce in his tempos. Likewise, oboist Francois Leleux's playing seems more virtuosic, more gymnastic, than Ms. Grafenauer's flute playing, though not necessarily more polished or more enjoyable. The album ends with Mozart's Symphony No. 32, a very brief and unusual single-movement work, about eight-and-a-half minutes long under Sir Colin Davis. Nevertheless, the single Allegro spiritoso contains a traditional slow segment about halfway through, so it is, in fact, like a mini symphony. Davis offers an energetic, scintillating reading that, in any case, never appears unduly rushed. In terms of sound, we get recordings spanning a twenty-year period. The Flute Concerto derives from a 1981 recording, and it is smooth and natural, slightly close-up, with a good ambient air, if not a lot of sparkle. The Oboe Concerto is the newest of the lot, recorded live in 2001. It sounds more closely miked than the Flute Concerto, somewhat wider in stereo spread and more open. However, it is not necessarily more realistic, and there is a little less orchestra depth and some occasional audience noise involved. The Symphony No. 32 comes from 1985, also recorded live, and sounding a bit more dynamic than the others, though with perhaps a touch more forwardness in the upper midrange. None of these recordings can lay claim to audiophile status, but they are satisfying in their own ways. Gunter Wand, Munich Philharmonic Orchestra. Profil PHO6046. Profil may make me think twice about live recordings. I don't usually care for them; they're too often vague and distant, with a plethora of audience noises in the background, or close-up and uncomfortable. But the several live recordings that the folks at Profil have remastered in the past few years have been of generally excellent sound quality, with only an unfortunate applause at the end to remind one that they are, indeed, live. This recording of Anton Bruckner's Symphony No. 4 "Romantic" is no exception. 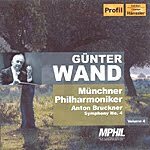 Conductor Gunter Wand, something of a specialist in Bruckner and Beethoven, was close to ninety when he recorded this symphony with the Munich Philharmonic in 2001. It would be among his last-ever performances and the next-to-last time he would conduct the "Romantic" Symphony, which he had been playing for close to sixty years. To say he knew the score inside and out by then would be an understatement. Here's the thing: Although Wand, always the old-school conductor, took his time developing the ideas in the music he played, his age may have also had something to do with the broad, slow tempos he adopts here. Not that they don't work; it's just that the symphony is longer than I've ever heard it. Yet when listening to it, the music seems just right. It doesn't actually strike one as slow. In fact, one could easily make the case that Wand's scrupulous shaping of the music makes the big, dramatic moments all the more momentous by their juxtaposition with a steady, careful buildup. Certainly, this is true of the first and last movements, with their alternating grand passions and outbursts. The meditative Andante works well at a leisurely pace, too, and the "Hunting" Scherzo has just the right zip to it. Originally recorded for radio broadcast, the performance sounds more than acceptable in its CD transfer. There is ample bloom in the lower midrange, a pleasantly realistic sheen to the strings, and a taut definition in the transients. Moreover, there is a good deal of overall clarity involved that seems to bring this live recording close to the actual concert hall. The disc may not be a number-one choice for the Bruckner Fourth Symphony nor displace Wand's previous couple of studio performances, but it is at least close. Eugen Jochum, Concertgebouw Orchestra. Philips Original Masters 475 8147 (5-disc set). Some years ago, I overheard the manager of a classical record store telling a customer that he thought Eugen Jochum and Karl Bohm were mere "kapellmeisters," routine bandmasters, neither more nor less. I kept out of it, but I couldn't help thinking how differently I felt about these conductors. Both of these men were leaders of great orchestras for something like six decades, and both of them produced recordings that even today are among the best ever made. Jochum, for instance, has never been surpassed in his performances of the late Haydn symphonies, the Brahms Piano Concertos (with Emil Gilels), the Mozart "Jupiter" Symphony, or Carl Orff's Carmina Burana, to name just a few. "Mere kapellmeister," indeed! To my knowledge, Jochum recorded the complete Beethoven symphonies in stereo three times: First on DG in the Fifties with the Berlin Philharmonic and the Bavarian RSO; then in the Sixties on Philips in the set we have here with the Concertgebouw of Amsterdam; and finally in the Seventies on EMI with the London Symphony Orchestra. I've heard most of these recordings at one time or another, and each of them has its merits. But for this review it's the Philips set were dealing with that includes the complete cycle in a budget-priced box; and while one can often do better buying individual conductors and recordings, this five-disc box is an excellent buy at the price. Granted, the set might not be an absolute and only first choice for most dedicated classical-music fans, but for the avid collector, the curious experimenter, or the casual listener, one can hardly lose. Everyone will have personal favorites among the Jochum-Philips group, mine being Nos. 4, 8, and 9. Perhaps because the former two are not among the biggest and most-popular of Beethoven's symphonies, they do not have as much competition; but his Ninth can easily compete with any of the multitudinous performances on record. Be that as it may, I find all of the interpretations wholly enjoyable, musical, lyrical, spirited, and joyous. At the other end of the spectrum, the only symphony in the set I don't think finds Jochum at his best is No. 5. There, he seems to lack the requisite spark, the electricity, the dynamism of several other conductors, like Kleiber and Reiner, for instance. The First and Second Symphonies, however, are done up in fine style, a bit old-fashioned, maybe, by today's standards, thanks to the period-instruments' crowd, but pleasurable. Jochum's Third is also quite good, appropriately epic in proportion, the energy strong and concentrated. The Sixth is a recording I have long held dear in Jochum's later EMI account, but on direct comparison, there is not much difference except in the very slightly warmer EMI sound. The interpretations are loving, flowing, tranquil, and unhurried, and they still bring much joy to the heart. In the Seventh, Jochum continues his affection with the music, a light touch bringing out the dance rhythms nicely. Finally, there is Beethoven's crowning jewel, the Ninth, in which Jochum may not sound quite as composed or as radiant as he did in his later EMI recording yet produces an intensity that is evident in every note. 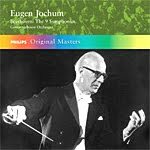 Jochum made these recordings between 1967 and 1969, just a few years before Philips began opening up the Concertgebouw sound to its fullest and richest degree. So don't expect as much of the rich, ambient bloom the orchestra enjoyed in many of Bernard Haitink's recordings of the Seventies and Eighties. Otherwise, there is a sweet naturalness to the Jochum sound, maybe not as smooth in the strings or as deep in the bass as we find in the very best audiophile discs, but good enough. Which is to say there is nothing wrong with these recordings. In fact, they sound better than many new digital efforts, and in the "smaller" symphonies like Nos. 1, 2, 4, and 8, especially, they are superlative. What's more, I compared these new masterings to the individual CDs that Philips issued some years earlier in their low-priced "Concert Classics" series, and I found these newer discs sounded smoother and plusher to me. Imagination? Probably. There is no indication Philips remastered them. In any case, this is a fine set at any price. Also, Concerto for Strings, Piano, Timpani and Percussion. Desiree Scuccuglia, piano; Antonio Ceravalo, percussion; Francesco La Vecchia, Orchestre Sinfonica di Roma. Naxos 8.572413. If you are unfamiliar with the music of composer, pianist, critic, conductor, and teacher Alfredo Casella (1883-1947), you are probably not alone. Casella was a leading Italian composer during the first half of the twentieth century and produced a prodigious output, yet record companies these days seldom record and major orchestras seldom play his works. After listening to his First Symphony in particular, one can understand why. For the sake of variety and comparison, this new Naxos disc couples Casella's first and last purely orchestral compositions, the Symphony No. 1 (1906) and the Concerto for Strings, Piano, Timpani and Percussion (1943), and they're so different they hardly seem to have come from the same person. The Symphony No. 1 begins with a big, dark, intensely driven opening movement, with loads of drama and a dearth of subtlety. As this is a première recording of the First Symphony by Maestro Francesco La Vecchia, we have nothing with which to compare La Vecchia's reading and will have to take his word about how it goes. The Symphony has only three movements, but they have so many contrasting tempos within them, it's hard to tell when one ends and the next begins. The booklet insert notes that Casella was a man of many moods and temperaments who composed in many styles, many of them before their time. While that may be, it doesn't make for a very smooth, polished, or unified First Symphony. If the jarring first movement points to the twentieth century, the slow second movement echos in some ways the Romanticism of the previous century and especially the exoticism of some Russian composers. The fact is, there is a little bit of everyone and everything in here that Casella probably ever heard, even a hint of Mahler in the Adagio and Bruckner in the massive, lumbering finale. Well, you can't say conductor La Vecchia, who probably knows this music better than any person alive, doesn't give his best shot. I just doubt that any musician could make much of this overly familiar yet contradictory material. While Casella wrote the Symphony No. 1 when he was relatively young, the composer being in his early twenties at the time, he wrote the Concerto for Strings, Piano, Timpani and Percussion toward the end of his life, and the added maturity of years shows. The piece does, after all, maintain a consistency of tone, something lacking in the First Symphony. The Concerto is pleasantly rhythmic, with a constantly throbbing pulse. Again, however, Casella may remind the listener of other composers, Bartok for instance or Stravinsky or Honegger. That's OK, because here the music at least comes across as more entertaining and more developed than the earlier work. 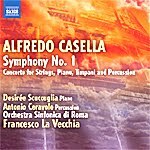 The Concerto is quite dynamic, with a note of despair, too, perhaps the result of Casella's having composed it in occupied Rome during the height of World War II. Naxos's sound for the Symphony, recorded in the Auditorium Conciliazione, Rome, in 2009, is rather bright and forward, sometimes even edgy, with little compensating bass support. To confound matters further, there is not much depth to the orchestral stage and precious little air or transparency to the individual instruments. On the other hand, the Concerto, recorded in the OSR Studios, Rome, in 2008, a year before the Symphony recording, appears more roundly and naturally reproduced, with smoother, more-realistic sonics. There is even a bit more depth to the orchestra, although the bass is still wanting. So, of the two works on the disc it is definitely the Concerto that is worth owning, the First Symphony more of a curiosity. Alice Coote, Natalie Dessay, Orfeon Donostiarra; Paavo Jarvi, Frankfurt Radio Symphony Orchestra. Virgin Classics 50999 694586 0 6 (2-disc set). Interestingly, during the lifetime of composer Gustav Mahler (1860-1911), his Symphony No. 2 was among his most-popular works. Today, I would hazard to guess that claim goes to his shorter symphonies, the First or the Fourth, at least judging by the number of recordings one finds of them. 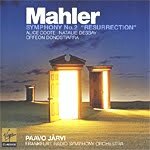 In any case, there is much to admire in the Second Symphony, which Mahler referred to as the "Resurrection" Symphony for obvious reasons. I recall conductor Bernard Haitink, a noted Mahlerian, remarking years ago something to the effect that there is enough drama in Mahler for the music to speak for itself if it's simply played straight, without too much personal embellishment. Conductor Paavo Jarvi and his Frankfurt Radio Symphony Orchestra carry out this dictum perhaps too carefully in their reading of the Second Symphony, rendering it as beautiful music, to be sure, but a tad lifeless. Anyway, as usual Mahler was toying with the ideas of life and death in the Second Symphony, in particular promoting his views on the joys of the next life, after resurrection. The Symphony is a long work, even by Mahler's standards, its five movements totaling usually from eighty to ninety minutes, here under Maestro Jarvi about eighty-five minutes. Mahler took over six years to write the work, off and on, not just because it was so long but because of other commitments, premiering the piece in 1895. The first movement is a long funeral march, which is not uncommon in Mahler symphonies. The composer said of it he was laying to rest the hero of his First Symphony and asking the question, What's next? Critics, always trying to make connections among Mahler's symphonies, often conclude that all nine (or ten or eleven) Mahler symphonies form one big, continuous whole. In any case, under Jarvi the funeral procession seems a bit more lumbering than usual, but at least Jarvi keeps up the forward momentum well enough. The slow Andante is in landler form, a dance precursor to the waltz. The composer said it represented memories of happy times in the hero's life, yet it seems somewhat at odds with the rest of the music. One just needs to go with it because it is lovely. Besides, Jarvi does his best work here, keeping the mood as consistent as possible with the preceding movement, which, as I say, is not particularly easy. Next, we have in the third section rondo one of Mahler's typically sarcastic waltzes, sounding like parody or burlesque, apparently mocking Man's aspirations in life. However, Jarvi seems intent on making it milder and more refined than maybe Mahler intended. The brief, quiet fourth movement, Urlicht, acts as a kind of introduction to the massive choral Finale (and, yes, Mahler worried that the conclusion would remind listeners too much of Beethoven's Ninth Symphony. He got over it. And, to be fair, the choral part of the movement only takes up in the second half). The work ends in a glorious last judgment and resurrection, or, as Mahler put it, "I shall die, so as to live." Jarvi brings the music to an appropriately moving close. Virgin engineers recorded the performance in 2009, capturing a very open, very clear, very detailed presentation, yet not without a proper degree of natural ambient bloom, mid-bass warmth, and realistic orchestral depth. We also hear an extra-wide dynamic range, which might lead some listeners to turn up the volume, a mistake when the big crescendos appear. The overall impression one gets is of slightly close-up sound--truthful, though--with a satisfying deep-bass impact. A minor snag: At eighty-five minutes, Jarvi's reading barely misses fitting on a single disc, so there is a second CD involved, with Virgin including only the twenty-three-minute first movement on disc one. Fortunately, Virgin priced the two discs at the cost of a single-disc, so at least you don't wind up paying for an expensive set. Great Scores from Hollywood's Golden Age. Steiner: The Beast With Five Fingers; Friedhofer: The Lodger; Young: The Uninvited. William T. Stromberg, Moscow Symphony Orchestra. Marco Polo 8.225132. You've got to admire that title. Who can resist "Murder and Mayhem"? 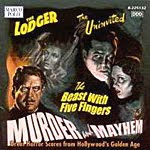 The program consists of suites from three thrillers of the mid Forties, the music reconstructed by John W. Morgan: from 1946 The Beast With Five Fingers (a favorite gothic chiller of mine growing up); from 1944 The Lodger (a Jack the Ripper yarn); and also from 1944 The Uninvited (an eerie ghost story). 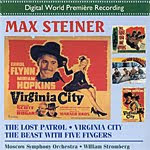 A famous writer of film music composed the score for each movie, the first by Max Steiner, the second by Hugo Friedhofer, and the last by Victor Young. Of the three works, though, it is by far Young's music for The Uninvited that is most memorable. British director Lewis Allen made The Uninvited in 1944 from a novel by Dorothy Macardle. It stars Ray Milland and Ruth Hussey as a brother and sister who begin seeing and hearing strange things in the night when they unwittingly move into a haunted house on the coast of Cornwall. The movie ranks among the two or three best ghost stories ever filmed, no small thanks to its musical soundtrack. Fortunately, it's the longest suite on the disc, a little over twenty-four minutes, and it contains the most evocative tunes. Chief among them is one called "Stella By Starlight," a pseudo-Rachmaninov affair for piano and orchestra, later in the film heard on violin and orchestra, and a few years afterward recorded by the likes of Frank Sinatra and Harry James. The Uninvited features mysterious-sounding mood music, descriptive scene accentuation, and good, old-fashioned Romanticism, all of it brought to life brilliantly by William Stromberg and his Moscow Symphony players, who have done this kind of thing so often it must be second-nature to them by now. The sound, recorded by Marco Polo in 1999, is an improvement over their previous work. This album is from the same team I have reviewed before in film music, but the sonics this time are less disproportionately warm and round, more detailed, and more immediate. There is a small degree of hardness to the upper midrange, to be sure, but otherwise it is solid and clean. A lengthy and highly informative booklet insert completes the package. Although I have to deem the whole project a success, I recommend The Uninvited in particular for repeat listening. Also, Klavierstucke, Op. 76. Nicholas Angelich, piano; Paavo Jarvi, Frankfurt Radio Symphony Orchestra. Virgin Classics 50999 266349 2. Johannes Brahms (1833-1897) premiered his Piano Concerto No. 2 in 1881, a product of his more relatively mature years. Whereas his Piano Concerto No. 1 of several decades earlier had been all craggy and muscular, the Concerto No. 2 is more lyrical, more relaxed, yet still a work of prodigious power and scope, with a huge opening movement that goes on for some eighteen minutes and three more following it (an unusual, four-movement arrangement for a concerto). 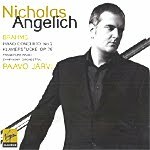 American pianist Nicholas Angelich's playing of the Concerto is not a mere addition to the orchestral accompaniment but very much a part of it, without actually usurping or overwhelming it. In other words, Angelich's piano and Paavo Jarvi's Frankfurt Radio Symphony Orchestra are of a piece, working to convey the music in both a monumental and gently poetic manner. However, after hearing the music in its entirety, one might say they tend to favor the former aspects of the score with quite a towering, weighty performance. The second movement is a Scherzo of sorts, although it has its lengthy moments of calm. Angelich uses this segment to display his virtuosity for all its worth. There follows an attractive Andante, in which Angelich seems to find himself most at home, the interplay between cello and piano most affecting. It is here, too, that the music most resembles that of Chopin, leading one to hope Angelich will record some Chopin in the near future (as I'm sure he will). A spirited, graceful, full-throated Allegretto grazioso brings the work to a close, with Angelich and Jarvi taking apparent joy in the rustic air of the music. Brahms's Klavierstucke, Op. 76, eight solo piano pieces that the composer wrote about the same time that he wrote his Second Piano Concerto, makes an appropriate companion. These little works are rhythmic, dreamy, rhapsodic, and bouncy by turns, and all highly Romantic. The recording, which Virgin made in 2009, is a trifle soft and thick, but in a way it suits the music by imparting an air of soothing mist to the proceedings. Still, I would have preferred more openness and clarity. The piano itself shows up well focused and well integrated within the orchestral picture, neither dominating the ensemble nor being enveloped by it. The overall impression is one of bigness above all, not transparency. While Angelich's performance of the Brahms Second Piano Concerto does not necessarily challenge the classic recordings from Emil Gilels (DG), Stephen Kovacevich (Philips and EMI), Arthur Rubinstein (RCA), Van Cliburn (RCA), and others, it is surely one to consider. William T. Stromberg, Moscow Symphony Orchestra. Naxos 8.557706. In my alternate life as Review Editor for DVDTOWN.com, I've gotten to watch a multitude of movies, old and new, over the years, more than I could ever have seen in a theater. And it always amazes how well some of the old film scores hold up as purely entertaining musical experiences compared to many of today's over-hyped, nondescript screen music. Little in the revved-up tunes of an Iron Man V, Transformers VIII, or X-Men X seems nearly so colorful or graphic to me as the music for a film like director Raoul Walsh's 1945 war saga Objective, Burma!, with Errol Flynn, James Brown, William Prince, and George Tobias. Franz Waxman (1906-1967) was one of Hollywood's premier composers in the Thirties through Sixties. If Max Steiner or Erich Wolfgang Korngold didn't write the score, you could be pretty sure Waxman did, things like Bride of Frankenstein, Philadelphia Story, Suspicion, Sunset Boulevard, A Place in the Sun, Rear Window, Mister Roberts, The Spirit of St. Louis; you get the idea. In the case of Objective Burma! (score restored by John Morgan), it isn't necessary to have seen the movie to enjoy Waxman's music because just a glance at the segment headings gives one a pretty good idea of what's going on, the music filling in the rest. Titles like "Briefing in an Hour," "Take Off," "Jumping," "Killing the Sentry," "Two Came Back," "Burmese Village," "Missing the Plane," "At Night," "Invasion," and "The Camp--Finale" pretty much tell the story in themselves. Then, with Stromberg's direction and Morgan's reconstruction, lo and behold, the music actually sounds like the pictorial images we envision, rather like a series of miniature tone poems, much of it march-based, of course. Waxman never composed music to sell soundtrack albums but to convey the nuances of every film he wrote for; it's hardly a clever or revolutionary concept, just a practical one that pays off. 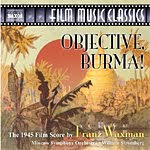 Originally released in the Marco Polo line in 2000 and now on the lower-priced Naxos label, Objective Burma! has the kind of sound we have come to expect from this source, William Stromberg and the Moscow Symphony having produced so many other good film recordings for the company. While the sonics are a bit less than completely open or transparent, plus a little distant, there is some relatively good, realistic stage depth and imaging involved. The sound has a pleasant overall bloom, reminiscent of live music even if it's not perfectly detailed. Fans of film music will enjoy the disc. Also, Webern: Im Sommerwind. Bernard Haitink, Chicago Symphony Orchestra. CSO Resound CSOR 901 1002. There was a time in the late Sixties, Seventies, and Eighties that I looked forward to any new recording by conductor Bernard Haitink and his magnificent Concertgebouw Orchestra of Amsterdam. You almost couldn't go wrong with his performances because the man always took a sensible approach to the music, and the engineers always captured a rich, resonant sound. After his leaving the Concertgebouw, I sort of lost track of him until now. He was the Principal Conductor of the Chicago Symphony Orchestra from 2006 until 2010, and this live recording with the CSO during that time period demonstrates that he hasn't lost his touch. Richard Strauss (1864-1949), the great composer of tone paintings (Don Juan, Death and Transfiguration, Also Sprach Zarathustra, Don Quixote, An Alpine Symphony), wrote Ein Heldenleben (A Hero's Life) as a semi-serious musical self-portrait in 1898 when he was only thirty-four years old. The piece is a kind of tongue-in-cheek autobiography in musical form, which showed the composer's supreme self-confidence, writing it as he did at such an early age. Mostly, he wrote it, though, to get in a few digs at his critics, who, in the music at least, he silences convincingly. As always in his interpretations, Haitink takes a rational, measured view of the work, yet he misses none of the big, triumphant moments, sublime serenity, or impish humor. In fact, the conductor's reading here is not substantially different from his 1970 performance with the Concertgebouw, available in a two-disc, mid-price set from Philips. Strauss wrote Ein Heldenleben in seven parts describing seven stages in the artist's life. The first segment, "The Hero," obviously describes himself and does so in large-scale, swashbuckling style, which Haitink takes apparent delight in presenting. Next, the music turns to "The Hero's Adversaries," his critics, where we hear them squabbling among themselves in amusing fashion, followed by "The Hero's Companion," his wife, who expresses herself sweetly in the strings, first wittily and then endearingly in the ensuing "Love Scene." "The Hero's Battlefield" is the centerpiece of the work, where Strauss engages in all-out war with his critics, reminding them musically of his accomplishments with bits from Don Juan and Zarathustra, as well as a few horns from Beethoven's Third Symphony "Eroica." Under Haitink, the movement is never hectic but quite thrilling despite its hustle and bustle. "The Hero's Works of Peace" is another slow movement, again a remembrance of the composer's previous tone poems as an almost-final rebuke of his foes. The work closes with "The Hero's Retirement from the World and Fulfillment," the longest movement, an attractive concluding note of contentment and repose for a life and art well spent, from which Haitink wrings the last ounce of grace and charm, without any hint of sentimentality or histrionics. With Haitink, Strauss's music rings out most eloquently. However, there is so much going on in Heldenleben, so many transitions and contrasts, that's hard for any conductor to help the fragments jell or coalesce into a smooth, flowing, meaningful whole. If Haitink doesn't always hold it together, either, we can hardly fault the conductor. 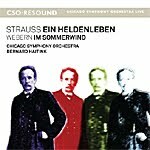 As a companion piece on the disc, Haitink chose Im Sommerwind (In the Summer Wind) by Anton Webern (1883-1945), another tone poem, this one an ode to Nature written when Webern was about twenty years old. However, Webern never published it, nor did he ever hear it played in his lifetime. He seems to have regarded the work as an early example of his foolish youth, and it would not be until 1962 that anybody would play it. Webern apparently thought he had matured beyond mere musical pictures into more-ambitious, more-modern compositions so kept Sommerwind under wraps during his lifetime. It's a shame, really, because the music is lovely in every way, and Haitink caresses each and every note. The CSOR audio engineers recorded the music live in Orchestra Hall, Chicago, in 2008-2009, using fairly close-up miking, especially in Ein Heldenleben. While this avoids most audience noise, it doesn't always impart much sense of concert-hall ambience to the proceedings (as Haitink's old Concertgebouw recordings for Philips did). Still, the sound shows up detailed and clean, with good dynamics, air, impact, and transparency. Of minor note, there isn't a lot of orchestral depth, the upper midrange is a trifle rough and bright, the treble can sometimes sizzle, there's a slight glassiness to the overall sound, and the bass is somewhat lacking. Nevertheless, the sonic shortcomings are hardly objectionable, and the important thing is that Haitink persuades us that this particular music of Richard Strauss and Anton Webern is highly listenable, even if it is mere tone painting. Dmitrij Kitajenko, Gurzenich Orchestra, Koln. Oehms Classics OC 665. Lord Byron published his dramatic poem Manfred in 1817, and since then several composers including Robert Schumann in 1849 and Peter Tchaikovsky in 1885 have set it to music. The poem is typical of the extravagant Romanticism of the young Byron, all about a tortured hero bedeviled by guilt over a mysterious affair with his half-sister Astarte, fleeing into the surrounding Alpine countryside, calling upon supernatural forces to free him of his pain, and then, tormented, rejected, downcast, and unable to forgive or forget but defiant to the end, finally dying unredeemed. How's that for melodrama? In the case of Tchaikovsky, he was reluctant at first to set it to music. He felt Schumann had already done it well enough, and there was nothing more he could add. Besides, he was not too keen on doing any more programmatic music, music that told a story or described a scene, despite the success of his Romeo and Juliet and Tempest overtures and Swan Lake ballet some years earlier. Go figure. Still, at the urging of friends and after a visit to the Alpine regions where Byron laid out the story, he proceeded, anyway. When he completed the Manfred Symphony, he hailed it as one of his best works. Then, after its lukewarm public and critical reception, he practically disowned it, saying only the first movement was any good. An artist's temperamental disposition, maybe, or just a reaction to apparent disapproval? Fortunately, the work survived (as did Tchaikovsky's interest in literary subjects, his doing a Hamlet overture a couple of years later as well as the Sleeping Beauty and Nutcracker ballets). 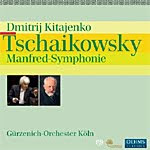 Maestro Dmitrij Kitajenko and the Gurzenich Orchestra, Koln, do their best to prove Tchaikovsky's assessment of the Manfred Symphony mistaken. In the first movement, marked Lento lugubre, Kitajenko builds a bewitching sense of mystery and shrouded involvement, the hero's theme describing Manfred as a sullen, brooding character. It's dark and shadowy, opening out into a seriously dramatic outburst after a lengthy introduction. This is admittedly an odd symphony, a combination of straight-out tone painting and old-fashioned storytelling, with a happier ending than Byron gave his hero and set within a symphonic musical structure. Kitajenko does well just to hold it together. After a rather histrionic close to the first movement, the relatively light, airy Scherzo, depicting an Alpine fairy, seems curiously out of place. I mean, we're almost in Tchaikovsky ballet territory here. Nevertheless, it is certainly entertaining enough, and again Kitajenko seems to be having fun with the music. A slow movement follows, conjuring up a picture of Alpine village life. It is mostly lilting, rhythmic, and tranquil, a calm before the closing bacchanal. The Allegro finale, the longest and most variegated movement by far, brings the work full circle, containing some of the symphony's most-memorable tunes. Here, Kitajenko could have perhaps whipped up even more energy, but his relative restraint helps maintain the overall equilibrium of the piece. This is a well-thought-out interpretation, the composer's often scattershot contrasts well integrated into a coherent whole. Oehms Classics present the 2009 recording on a hybrid stereo/multichannel SACD, playable on any CD, DVD, or Super Audio CD player. I listened in two-channel stereo using a Sony SACD player and found the results most pleasing. The engineers appear to have miked the orchestra fairly close up, yet not so close that the music sounds compartmentalized, overbright, or edgy as can sometimes happen under these conditions. There are strong dynamics and impact involved, with on occasion a few really strong jolts from the ensemble; a reasonably decent sense of stage depth; and a fine, delicate, extended high end. What's more, the sound emerges well balanced and ultrasmooth, at times a touch too smooth but making for comfortable listening. While I thought I heard some audience noise between movements, indicating that Oehms may have recorded the music live, there is no mention of it on or in the packaging. So, does this new performance of the Manfred Symphony displace my old favorites from Riccardo Muti and the Philharmonia Orchestra (EMI) or Mariss Jansons and the Oslo Philharmonic (Chandos)? Although not quite, it comes close, and the vigorous, effortless sound is surely persuasive. Also, The Beast with Five Fingers; The Lost Patrol. William Stromberg, Moscow Symphony Orchestra. Marco Polo 8.223870. This is not a soundtrack album. Thank goodness. I remember coming out of a big, THX-equipped movie theater recently and finding that my ears were ringing from the overloud, over-bright sound. Later in the week I noticed a newspaper ad for the CD of a particular movie soundtrack, exclaiming that the digitally remastered sound was "just like in a theater!" No thank you. It wasn't that I couldn't have enjoyed the movie's sound if it weren't so loud or bright; I just didn't want it sounding like that in my living-room stereo system. The fact is, movie-theater sonics belong in a movie theater, where their glaring, aggressive noises do the most good, not in my music room. By contrast, Max Steiner's film music on this Marco Polo CD, played by the Moscow Symphony, sounds like just what it is: movie music played by a real orchestra in a live setting. It's a relief to hear it after going to the movies as much as I do and listening to so much deafening soundtrack music. End of rant. Max Steiner (1888-1971), often regarded as the "father of film music," came to Hollywood in 1929 and registered his first big hit with King Kong (1933), which was among the very first films to use an extensive, original musical score specific to the movie. Then Steiner went on to do practically every big picture the Warner Bros. studio made in the Thirties, Forties, and Fifties, finally slowing down and finishing his career in the early Sixties. If the opening bars of The Lost Patrol (1934) remind you of Casablanca (1942), you'd be right. Steiner did the Bogart film just eight years later, and there's much the same flavor here. The music for The Beast with Five Fingers (1946), on the other hand, Peter Lorre's hand to be precise, is lurid and melodramatic; it was one of the only horror films Steiner ever scored. But the real gem is the Errol Flynn movie, Virginia City (1940), filled with melodies that might have made Aaron Copland envious. The music for all three films, arranged, restored, and reconstructed by John Morgan, fits into suites of twenty or more minutes each, and they provide a good cross section of the scores Steiner produced for almost four decades in Hollywood. Marco Polo's sound is quite natural, maybe a little distant and a little soft on detail but delivering good depth and imaging. The album makes an attractive deal for movie buffs as well as music lovers, and it provides a welcome antidote for listeners whose heads are throbbing from typical movie soundtracks. Mstislav Rostropovich, cello; Herbert Tachezi, Hugh Wolff, Seiji Ozawa; Saint Paul Chamber Orchestra, London Symphony, Boston Symphony. 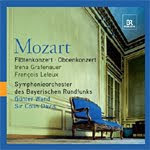 Warner Classics 0927 49706-2. 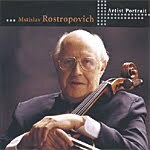 Russian cellist and conductor Mstislav Rostropovich (1927-2007) probably recorded the basic cello repertoire about a dozen times over, so it's no surprise that Warner Classics could gather together eleven short selections from their own catalogue of Teldec and Erato releases. Whether you think they are the best recordings this bigger-than-life artist ever made is a matter of personal opinion, but certainly there is much here to admire. In the various recordings, the Saint Paul Chamber Orchestra, the London Symphony, and the Boston Symphony accompany Rostropovich, the ensembles lead by maestros Herbert Tachezi, Hugh Wolff, and Seiji Ozawa. The eleven selections on the disc include the Allegro from Tartini's Cello Concerto in D major; Vivaldi's Cello Concerto in D minor, Tchaikovsky's Variations on a Rococo Theme, Bach's Adagio from the Organ Toccata in C major, arranged by Alexander Siloti, the Allegro giusto from Prokofiev's Symphony-Concerto for Cello and Orchestra, the Adagio from Dvorak's Cello Concerto in B minor, and the Allegretto from Shostakovich's Cello Concerto No. 1, among others. Although I don't really care much for bits and pieces of music, of the bunch offered on the collection, I liked the Tchaikovsky Variations best. They seem to encapsulate all that is good about Rostropovich's playing, the various moods, the thrill, the excitement of his cello. Not that he doesn't carry off the other works with equal aplomb, but Tchaikovsky seems to bring out the best in the man, the flair, perhaps. The Warner sound is uniformly warm and comfortable. There is not much visceral thrill to it, not a good deal of transparency or air or dynamic impact, but there is a pleasantly realistic bloom and a modestly wide stereo spread. Warners' "Artist Portrait" series may simply be another way of repackaging old material, but this entry, at least, has a few pleasant merits. Maria Callas, Tito Gobbi, Luigi Alva; Alceo Galliera, Philharmonia Orchestra and Chorus. EMI 5099 9 4564442 9 (2-disc set, plus CD-ROM). Italian composer Gioachino Rossini (1792-1868) wrote the comic opera Il Barbiere di Siviglia (The Barber of Seville) in 1816, based on one of French playwright Pierre Beaumarchais's three plays (or operas comique) on the subject. Mozart had already done the second of Beaumarchais's plays several decades before Rossini did his, so audiences were already familiar with some of the characters. I have no idea if conductor Alceo Galliera's account of the opera with Maria Callas is the best one available. For at least the past century we've had a multitude of recordings of Il Barbiere. The fact is, though, I've lived with this EMI set for so long, I have little with which to compare it. I came to the 1957 recording sometime in the early Sixties when I was in college, and I've owned it on LP and CD ever since. EMI remastered the recording in 2007 and issued it in their "Great Recordings of the Century" line. Now, in 2010, they've re-released it in a three-disc set, this time with a CD-ROM containing a synopsis and libretto. Maria Callas is hardly a singer one usually associates with lighthearted comedic roles, but she excels in Il Barbiere. She's delightfully impudent and flirtatious, and, of course, she sings splendidly. The booklet note says that she preceded this performance with a disastrous stage rendering in which she overacted drastically. No such impression here; she seems born to the part. However, Callas's Rosina does not overwhelm the production. The rest of the cast, especially Tito Gobbi as Figaro, are splendid, too, as is maestro Galliera, who leads the production with sparkle. If there is any minor drawback, it's that the discs do not present the opera absolutely complete. But the presentation is close enough, and I doubt that anyone but the most-fastidious opera lover would notice the cuts, and even then they might not care. EMI's sound was never so good as here, either. In comparing the earlier, 1986 CD mastering with this newer remastering, I found the new one both clearer and smoother. The older recording seems warmer, true, but it is also more muffled and rougher around the edges. Indeed, there are parts of this new remastering that sound almost state-of-the-art, a tribute to producer Walter Legge's artistic integrity and balance engineer Robert Gooch's impeccable miking. 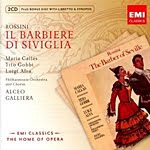 I love the Galliera/Callas/Gobbi interpretation of Il Barbiere di Siviglia from beginning to end: for its wit, its charm, and its liveliness. Moreover, with its spruced up sonics coming up fresher than ever, it's even harder to resist than before. In other words, I see no reason to change my opinion of this recording after all these years. Serenade melancolique; Souvenir d'un lie cher; Valse-Scherzo. Ilya Kaler, violin; Dmitry Yablonsky, Russian Philharmonic Orchestra. Naxos 8.557690. 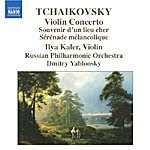 There is no want of Tchaikovsky Violin Concertos on the market, many of them very cheap and many of them very good. But there is always room for one more when it is as good as this one. That it comes at so low a cost is icing on the cake. Violinist Ilya Kaler plays with excitement and conviction, fire and soul, which are sometimes missing in a work that requires a good deal of Russian passion. One of the first criticisms of the Concerto was its supposed trivial "Cossack" element, something that today has become its biggest selling point. Anyway, Kaler does not shy away from the big moments, yet he seems equally at home in the meditative stages, too. I thought during the first few minutes of the performance that Kaler lacked the requisite fervor for this work, but either he or I warmed up to the proceedings, and by the time it was over, I was a believer. In addition, the disc offers up the Serenade melancolique, the Souvenir d'un lie cher, and the Valse-Scherzo, all worthy, if lesser-known Tchaikovsky pieces. Personally, I would have opted for a second violin concerto, maybe the Lalo concerto that inspired Tchaikovsky, but that's neither here nor there. The Naxos sound helps a lot, too. In terms of clarity and dynamics, it's terrific. It's one of Naxos's best efforts in years. Very, very clean; no bass overhang or fuzzy, muddy midrange whatsoever. However, one has to put up with a certain one-dimensional quality, with not much depth to the orchestral field, and the soloist prominently out front. By comparison, Heifetz on RCA sounds softer but more realistically represented. What's more, you can find the Heifetz disc at mid price, only a couple of dollars more than the Naxos, with an interpretation even more virtuosic than Kaler's. Nevertheless, for an inexpensive, absolutely clean digital recording of the work at a low price, Kaler is hard to beat. Also, Rimsky-Korsakov: Capriccio Espagnol. Edo de Waart, Rotterdam Philharmonic Orchestra. PentaTone Classics SACD PTC 5186 153. The Russian composer Sergei Rachmaninov (1873-1945) was among the last of the great Romantics, although, ironically, his earliest critics accused him of being too "modern." Be that as it may, his Second Symphony can easily take its place alongside the symphonies of Tchaikovsky, probably even out-romanticizing the older man. Today, Rachmaninov gets the cold shoulder from critics who consider him too glamorous, too light, too frothy, too sentimental, too frilly, too Hollywood. Take him or leave him, though, his Symphony No. 2 continues to be one of the most popular pieces of classical music ever written. While Philips recorded Edo de Waart's 1976 performance with the Rotterdam Philharmonic in four-channel quadraphonics, they released it only in two-channel stereo. Then it disappeared relatively quickly. PentaTone resurrected it on a hybrid SACD in its original multichannel format as well as super-analogue stereo and regular stereo. So it will play on ordinary CD players as well as SACD players. 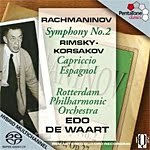 De Waart's interpretation of the Second Symphony is fine, but alongside the very best recordings, like those from Andre Previn and the LSO (EMI), Mikhail Pletnev and the Russian National Orchestra (DG), or Eugene Ormandy and the Philadelphia Orchestra (Sony), it seems rather too straightforward, too matter-of-fact. It's a somewhat quick-paced reading that misses some of the very Romanticism for which people know the work. This doesn't make a bad performance by any means, and, in fact, it may appeal to the work's critics since it shears the symphony of some of its more flamboyantly starry-eyed characteristics. On the other hand, de Waart directs the companion piece on the disc, Rimsky-Korsakov's Capriccio Espagnol, just as vigorously yet maintains a splendid atmosphere, color, and excitement. The PentaTone sound in stereo, regular or SACD, is slightly thin and a bit forward in the mid highs, which seems the opposite of the full, warm acoustics needed, especially to convey Rachmaninov's expressive imagination. Still, the sound may be in keeping with de Waart's vision of the piece, so I suppose all is well. String Quartets No. 9, Op. 59/3; No. 15, Op. 132; No. 2, Op. 18/2; and No. 14, Op. 131. Artemis Quartet. Virgin Classics 50999 607 102 0 8 (2-disc set). 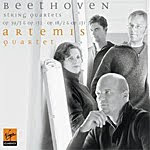 Recorded by EMI-Virgin in Koln, Germany, 1998 and 2002, these four Beethoven string quartets played by the Artemis String Quartet receive what is, I believe, their first release in America. At least, if Virgin issued them over here earlier, the discs escaped me. The interesting thing about this particular collection is that it shows us clearly the contrasts among Beethoven's chamber works, which in itself makes the disc unusual. Beethoven's early chamber pieces were pretty conventional by the standards of his later work, and here we get both early and late string quartets. Things begin with the String Quartet No 9 in C major, Op. 59, No. 3, the third of three quartets the composer wrote in 1804-06 for Count Andrey Kirilovich Rasumovsky, a music lover with the means to hire his own house ensemble, in which he sometimes himself played. By this time Beethoven's chamber works were becoming quite a bit more mature and complex than those of his contemporaries, and they were also becoming ever more perturbing for his audiences. Many critics of the day, baffled by what they heard, simply dismissed them. No. 9, for instance, is all about contrasts, which Beethoven's listeners must have found unfathomable. After an opening movement of tonal and stylistic disparities, the second movement flows with a wonderfully fluid pizzicato rhythm, followed not by a traditional Scherzo but by a Minuet and then a highly charged finale, which the Artemis Quartet might have played with even more zest. Next up on disc one is the String Quartet No. 15 in A minor, Op. 132. It comes much later (1824-25) than the preceding piece, and it's done up in five movements rather than the usual four. Beethoven continued to innovate, producing a sedate, almost somber opening section with sudden outbursts; a relaxed second movement; an incredibly touching slow movement sounding at first like a solo organ playing a mournful but moving dirge before breaking out into a more plaintive, emotional appeal; then a march (Napoleonic times, after all, making military motifs common); and at last an ardent but otherwise fairly commonplace closing movement. Disc two begins with the earliest of the works included, the String Quartet No. 2 in G major, Op. 18, No. 2, a part of Beethoven's first-ever string quartet cycle in 1798. This is a light, blithe, fluent, wholly delightful piece, more in line with the kind of chamber music folks of the time commonly heard. True, an odd outburst of activity erupts in the middle of the slow movement, but this is about the only unusual element in the structure. There is a sly, witty Scherzo, and finally a concluding Allegro of charm and grace. Again, the Artemis group play with such polish they don't alway open up the joy and excitement they could, but there is no denying their finesse. Finally, we hear the String Quartet No. 14 in C sharp minor, Op. 131, a complete change of pace from the little Quartet No. 2 that goes before it on the disc. Beethoven wrote No. 14 in seven movements this time; moreover, they are seven movements that sort of run into one another. Compared to the cheerfulness of No. 2, this one is more solemn, a note of melancholy tinging even the faster sections. The Artemis Quartet (Natalia Prischepenko, violin; Heime Muller, violin; Volker Jacobson, viola; and Eckart Rung, cello) play elegantly, precisely, but without some of the passion one hears from other chamber groups. Perhaps they are intent on presenting the music as objectively as possible, I don't know; it's a commendable virtue that, unfortunately, doesn't always pay off in the greatest involvement for the listener. Still, if it's the music one considers foremost, the Artemis players pay the right dividends. My only quibble is actually with Virgin Records for their arrangement of the quartets on the two discs. I would have preferred seeing them presented in chronological order to be able to hear the composer's progress of thought and style over the years. I suppose one can easily do this by simply playing them in whatever order one chooses, but it would have been easier (provided the music fit on the discs properly) for Virgin to have done it for us. The sound of the four instruments, incidentally, blends nicely in Virgin's moderately close-up recording, making for a comfortable listening experience. The sonics are warm and smooth, the musicians well spread out across the speakers, with an especially taut cello response. The miking is close enough to produce good detail yet displays enough ambient bloom around the instruments to bring out a lush, plush, relaxing sound. Also, Stone Flower suite; Dreams; Andante, Op. 50; Autumnal, Op. 8. 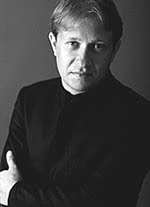 Neeme Jarvi, Scottish National Orchestra. Chandos CHAN 10481-X. Every line is in place, every "i" dotted. 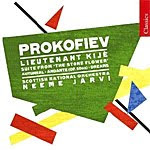 Maestro Neeme Jarvi conducts a letter-perfect performance, and the Scottish National Orchestra play with a precision that would make the Berlin Philharmonic jealous. So, why does this Lieutenant Kije suite sound so dull? It's certainly not the fault of Russian composer Serge Prokofiev (1891-1953), who pulled off a popular coup by satirizing governmental bureaucracy at a time, 1934, when the Soviet government was not exactly friendly to anything but conservative, state-approved music. Prokofiev accepted an invitation to write the score for a movie, Alexander Feinzimmer's Lieutenant Kije, based on a satirical story by Yuri Tinyanov. The story takes place during the reign of the nineteenth-century Czar Paul, who had a rage for military pomp and ceremony. The Czar mistakenly overhears a phrase that he thinks sounds like "Lieutenant Kije," and his underlings are afraid to tell him otherwise. So they create a fictional Kije, duly enter him into the military records, and create a career of adventures for him. Thus, we get the suite the composer adapted from his film score. The music can be wonderfully witty and mischievous, yet here it seems hampered, toned down, and it appears to be Jarvi's interpretation that is at fault. It is rather slow, solemn, and listless, missing some of the music's edgy humor and punch. Fortunately, the accompanying works, particularly the suite from Prokofiev's ballet The Stone Flower, come off much better, the conductor's sensitivity completely at the disposal of the music. And with fine, vintage Chandos sound, the rest of the items on the program--Prokofiev's Dreams, the Andante, Op. 50, and Autumnal, Op. 8--go over smoothly and agreeably as well, if sometimes taken a bit hastily. Recorded in 1985 and 1989 and here presented in a rerelease, the sound is wide and spacious, with an especially good sense of orchestral depth. While it perhaps lacks a little something in terms of inner detailing and deep bass response, it's surely good in all other respects. The problem with the album, then, is the centerpiece, Lieutenant Kije, which I wouldn't call a first-choice recording of the work. For top recommendations you'd have to go to musicians like George Szell and the Cleveland Orchestra (Sony), Vernon Handley and the LPO (EMI), Andre Previn and the LSO (EMI), or maybe Fritz Reiner and Chicago Symphony (RCA). But at a reduced reissue price and with good accompanying performances, the Jarvi disc is certainly worth auditioning. Martin Pearlman, Boston Baroque. Telarc CD-80688. The concerto grosso was an important type of Baroque concerto, usually featuring a small set of solo instruments contrasted against a full orchestra. The form first developed around the mid seventeenth century and continued well into the eighteenth century, sometimes distinguished as "church" and "chamber" concerti until Torelli, Vivaldi, Bach, and others discarded the distinctions. The concerto grosso obviously evolved into the modern concerto for solo instruments we know today. Telarc's booklet note for this disc informs us that George Frideric Handel (1685-1759) wrote his twelve Concerti grossi, Op. 6 (1739), in an astonishing one month! The cheap shot would be to say that it sounds like it, many of the concerti seeming for all the world alike. In fact, when listening to these works, I'm never sure when one has ended and the next has begun. 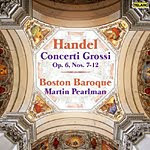 But for folks who enjoy them, this new recording of the last six of them by Martin Pearlman and his Boston Baroque orchestra playing on period instruments is probably as good as any. Pearlman gave us the first six of the opus some years earlier, and I understand that the critics and the public were kind to them. Although I have not heard the earlier set, I expect they are much the same as these, because what's not to like. The performances are lively in the outer movements and often serenely introspective in the Largos and Adagios. If anything, the contrasts may appear perhaps too pronounced, but I enjoyed the intensified effect. On period instruments we don't get quite as imposing an effect as we do with some performances on modern instruments, but Pearlman and his players are certainly graceful and refined, which helps make up for any lack of outright weightiness. Moreover, Telarc's sound, recorded in 2007, is wonderfully realistic: warm, mellow, resonant, yet miked closely enough to provide plenty of breadth, detail, and depth. If you like the music, this disc and its earlier companion are among the best you'll find. Also, Symphonic Minutes; Suite in F sharp minor, Op. 19. Eldar Nebolsin, piano; JoAnn Falletta, Buffalo Philharmonic Orchestra. Naxos 8.572303. Erno (or Ernst) von Dohnanyi (1877-1960) was one of those twentieth-century throwbacks to the Romantic Age who continued to produce lush, melodic music long after it had gone out of style. He was a Hungarian composer, conductor, pianist, and teacher who came into disfavor with his government in the 1940's and moved to America. 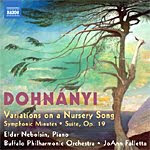 Today, we probably know him best for his Variations on a Nursery Song, which forms the centerpiece for this 2010 album, ably performed by pianist Eldar Nebolsin, conductor JoAnn Falletta, and the Buffalo Philharmonic. The first selection on the disc, however, is Dohnanyi's Symphonic Minutes (1933). It is a light, airy piece, sounding a lot like ballet music. The five movements are quite rhapsodic, yet sparkling, too, with an entertaining section for percussion. It is brief at only about fifteen minutes and firmly rooted in the German Romantic tradition of Beethoven and Brahms the composer knew best. Yet it also leans considerably toward the expressionism of Debussy and Ravel, at least in the gentle manner Falletta and her orchestra approach it. The second selection of three on the disc is the central item, the Variations on a Nursery Song (1914) for piano and orchestra. It is humorous and charming in its deliberately contentious juxtaposition of heavy Wagnerian moods and children's nursery rhymes. Think of Mahler and Mother Goose in the same room. My introduction to the music came in the early Seventies with an EMI recording by pianist Christina Ortiz, still available on various budget and mid-priced EMI CD collections and still a top choice. In the Variations, Dohnanyi presents a children's theme, "Ah, vous dirai-fe, Maman" (known to most of us as "Twinkle, Twinkle, Little Star"), with eleven variations, plus an introduction and a conclusion. Ms. Falletta and pianist Eldar Nebolsin appear to be having a good time with the music, again caressing it gently, with a particularly felicitous waltz section and a virtuosic performance from Nebolsin in the finale. The concluding selection is Dohnanyi's Suite in F sharp minor, Op. 19 (1908-09). Like its companions on the disc, it is a series of variations, this time set within a conventional four-movement arrangement. The variations themselves form a movement practically of their own directly following (or a part of) the opening Andante and before the closing Scherzo, Romanza, and Rondo-Allegro. This earliest of the pieces on the program is also the longest (at about thirty minutes) and the most somber. In addition, it is the least distinctive of the works, serious to a fault, and not as memorable as the other two. However, there is a delightful third variation, appropriately marked and played Andante tranquillo, quite beautiful taken on its own. The Scherzo and the Rondo have a Mendelssohnian feel to them, and Falletta and company play them most agreeably, with plenty of gusto in the concluding percussion work. The Naxos sound, recorded in 2008, is almost nondescript. There is certainly nothing wrong with it; it's just that there isn't much about it that stands out. The frequency range and dynamic response are fine, but without being too extended. Clarity is fine as well, without being particularly transparent. Stage depth is somewhat two-dimensional, and a slight softening hides some of the midrange behind a thin, dull veil. So don't expect the disc to sound exactly of audiophile quality, just pleasantly relaxing. Kiri Te Kanawa, soprano; John McGlinn, New Princess Theater Orchestra. EMI 50999 6 06689 2. The tunes of George Gershwin (1898-1937) pretty much summed up the music of the 1920's and 30's, mainly because he wrote so much of it. Not only did his work permeate the Broadway stage, it made its way into Hollywood talkies and classical symphony halls all over the world. 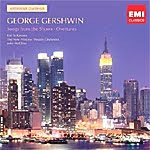 If this newly reissued EMI disc of Gershwin overtures and songs is any indication, the man is as popular today as he's ever been. EMI combined two 1986 recordings on this single mid-priced disc, a bargain running over seventy-nine minutes. The first half of the program contains the Gershwin overtures, preludes, and suites made by conductor John McGlinn and the New Princess Theater Orchestra, a pickup group of musicians named after New York's old Princess Theater, long gone. The second half contains the album Kiri Sings Gershwin, with soprano Kiri Te Kanawa singing a dozen of Gershwin's most-famous songs, with McGlinn and company in accompaniment. For me, the first half of the newly rereleased material is the most successful. It consists of seven purely orchestral selections in their original arrangements, some painstakingly reconstructed from archival scores, played with authenticity and panache by Mr. McGlinn and his group. The selections include two pieces from the film "A Damsel in Distress" (a suite arranged by McGlinn and an extended dance sequence, "Stiff Upper Lip"); the overtures from "Girl Crazy," "Tip-Toes," "Primrose," and "Oh, Kay! "; and the prelude from "Of Thee I Sing." It's all done in a breezy, lively, purely Jazz-Age style. The second half of the album is more problematical, depending upon how you react to soprano Kiri Te Kanawa singing popular American tunes. She had done this kind of thing before. Leonard Bernstein chose her to sing the lead in his recording of West Side Story in 1984, and she did a recording of South Pacific in 1986. Her voice is glorious, of course, but in Gershwin she seems a little out of place. Namely, she often seems too operatic, too cultured and refined for the music, too unbending in her rhythms. I would have preferred someone a bit more sympathetic to Gershwin's brand of pop-jazz. In any case, Ms. Te Kanawa sings renditions of each of the songs arranged in their original forms, so we get a touch of genuineness in the proceedings. The songs include "Somebody Loves Me," "Boy Wanted," "Things Are Looking Up," "Love Walked In," "Love Is Here to Stay," "Someone to Watch Over Me," "But Not for Me," "Summertime," "Nice Work If You Can Get It," "By Strauss," "Embraceable You," and "I Got Rhythm." The 2010 reissued sound, which EMI originally recorded in July, 1986, is outstanding in almost every way. The orchestral arrangements for a midsized band are lucid and engaging, with excellent stage depth and transient response. If I had to criticize anything in a minor way, it would be that the bass is somewhat thin and the strings a tad forward. However, these qualities add to the overall transparency of the sonics, so we don't lose much. The resultant sound, with its vibrant dynamics and stimulating percussion, is almost demonstration quality and goes a long way toward selling the disc. Also, Revueltas: La noche de los mayas. Gustavo Dudamel, Simon Bolivar Youth Orchestra of Venezuela. DG B0014281-02. One may initially flinch upon learning that the disc has two potential drawbacks: The performing ensemble is a youth orchestra, and DG made the recording live. Nevertheless, if you give it a chance, you may come to see that these possible handicaps are hardly detriments at all. Russian-born composer, pianist, and conductor Igor Stravinsky (1882-1971) came to prominence with his music for the ballets L'Oiseau de feu (The Firebird), 1910, Petrushka, 1911, and Le Sacre du printemps (The Rite of Spring), 1913, the latter causing quite a stir in its day and establishing the composer as bad boy of classical music. Its pounding beats also helped shape the path of subsequent twentieth-century music, making Stravinsky not only controversial but a true revolutionary. Today, we accept The Rite of Spring as an established classic, but, obviously, it wasn't always so. Gustavo Dudamel is a relatively young (b. 1981) Venezuelan conductor who came to fame through his energetic leadership of the Simon Bolivar Youth Orchestra of Venezuela, a fame that has led him to the principal conductorship of the Gothenburg Symphony, Sweden, and the musical directorship of the Los Angeles Philharmonic. 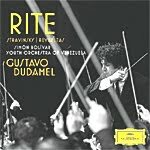 For the present recording, Dudamel chose to perform The Rite of Spring, a piece of music tailor-made to fit his temperament and the orchestra's, all of them full of vim, vigor, and vitality. And that's certainly how they play the Stravinsky, for all it's worth. The "Introduction" to Part I, The Adoration of the Earth, is appropriately soft and hushed, leading to an explosive opening of the "Spring" and "Game" sections, falling back to a subdued yet portentous set of "Rondes," helped by the strong impact of DG's sonics. He then whips up a small storm with the "Rival Tribes," followed by an almost deathly silence before the eruptions of the "Sage" and the "Dance of the Earth." We get a similar treatment of Part II, The Sacrifice. It is spooky, pulsating, tempestuous, poetic, red-hot, tender, and brutal by turns. Dudamel says the music has the energy of youth, so it's a pleasure for him to play the piece with a youth orchestra. He might have added that it must have been a pleasure to work with an orchestra of youngsters who don't sound in any way like youngsters but like remarkably polished, adult professionals. The accompanying piece, La noche de los mayas (The Night of the Mayas), by Mexican composer Silvestre Revueltas (1899-1940), has a similar rhythmic energy to The Rite of Spring. This time, however, the conductor hasn't quite as heavy-duty a score with which to work, Revueltas having written his music as a movie score. It is, understandably, a little more fragmented and a little less radical than the Stravinsky piece. Still, it carries us through a most-festive experience, the percussion standing out and selling the music, especially in the final, rambunctious movement. Is any of this more than just surface gloss? If it is, it's pretty exciting gloss; maybe not a first choice in the material but worthy of a listen. DG recorded the performances live in early 2010, but you'd hardly notice they were live until an unfortunate applause erupts at the end of the program, ruining the mood. Otherwise, the audience is quiet, and the sound is fairly good. There is good orchestral depth, and while the midrange is sometimes a tad veiled, the extremely wide dynamics and tremendous impact tend to make up for it. The upper midrange can be a bit forward, though, and at times downright fierce. Happily, it is not entirely distracting. On a final note, I would note that the disc's output is on the low side, perhaps to accommodate the wide dynamic range, so you may need to turn up the gain on your amplifier a touch more than you might usually have it set.